Objectives The aim of this investigation was to evaluate the pancreatographic findings and dynamics of pancreatic duct diameter, as determined by secretin-enhanced magnetic resonance cholangiopancreatography (S-MRCP), in patients with acute alcoholic pancreatitis or chronic alcoholic pancreatitis and in a control group. 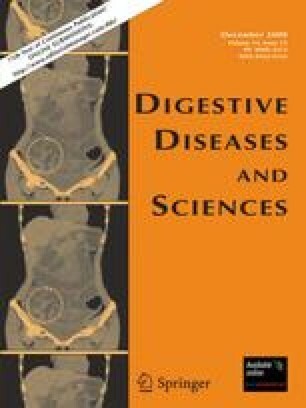 Methods S-MRCP was performed in patients with acute alcoholic pancreatitis who did not manifest the functional and radiological (ultrasonography and computed tomography) criteria of chronic pancreatitis (n = 21), in patients with chronic alcoholic pancreatitis (n = 28) and in a control group (n = 16). The diameter of the main pancreatic duct (MPD) was monitored before secretin administration and at 3 and 10 min after secretin administration. Morphological features were also assessed before and after the administration of secretin. Results All ductal diameters were significantly larger in chronic alcoholic pancreatitis (P < 0.0001). There were no differences in MPD caliber between patients with acute alcoholic pancreatitis and the control group. The percentage of variation between basal MPD diameter and at 3 min post-secretin administration was lower in patients with chronic (35.5%) pancreatitis than in those with acute alcoholic pancreatitis (52.3%) and the control group (52.5%). There were no significant differences between patients with acute alcoholic pancreatitis and the control group in terms of the frequency of visualization of side branches, ductal narrowing, intraluminal filling defects, and ductal irregularity. One patient with acute alcoholic pancreatitis presented ductal criteria of chronic pancreatitis following the administration of secretin. Conclusions The dynamics of MPD visualized on S-MRCP in patients with acute alcoholic pancreatitis is similar to that observed in the control group and different from that observed in patients with chronic alcoholic pancreatitis. There were no significant differences between patients with acute alcoholic pancreatitis and the control group in terms of morphological pancreatographic features.